A great guitar has only one job: to inspire you to play your best, and to help you reach for new sounds that you wouldn't have achieved otherwise. With the LTD Xtone PS-1, you may approach your style of music in an entirely new direction. It's a semi-hollow guitar that can take you from a formal setting to a dingy club and still look cool the whole time. Whether you play metal, alternative rock, indie folk, or progressive fusion, everyone will be blown away by the great look, sound, and -- if you let them play it -- feel of the PS-1. 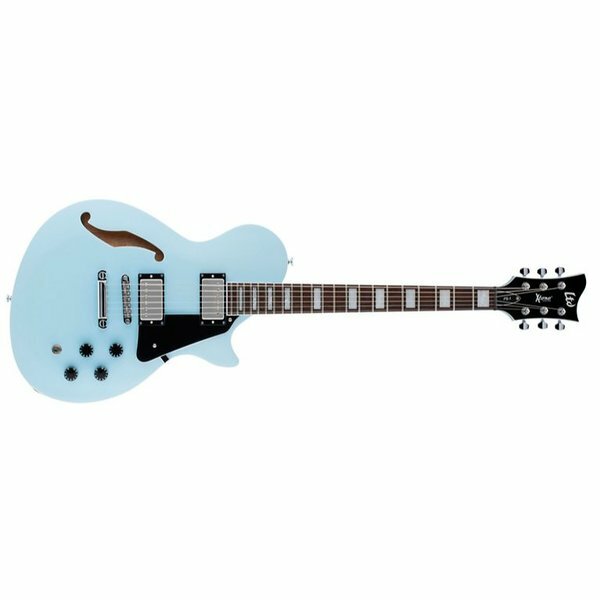 Available in Black as well as Sea Foam Green and Sonic Blue finishes, the PS-1 will set you in a class by yourself with its chambered mahogany body, maple neck, and roasted jatoba fingerboard with 22 extra-jumbo frets. It even features full binding on the body, neck, and headstock. The PS-1 includes a set of ESP Designed LH-150 pickups that sound great, and are controlled by individual volume and tone knobs so it's easy to play with versatile styles even during the same song.